EXTRA! EXTRA! New Show Coming Soon! Procrastinating + Busy-ness = Late Post! The rumours are true! I’m writing a brand new one-lady show called A Book By Its Cover that I’ll be premiering it next Thursday, April 17 until Saturday, April 19 at the Havana Theatre in Vancouver. The show is in sketch format, exploring the idea of first impressions and how no one is ever what they seem. I might spit some mean rhymes (rap), I might dance interpretively, I might even CHANGE YOUR LIFE! 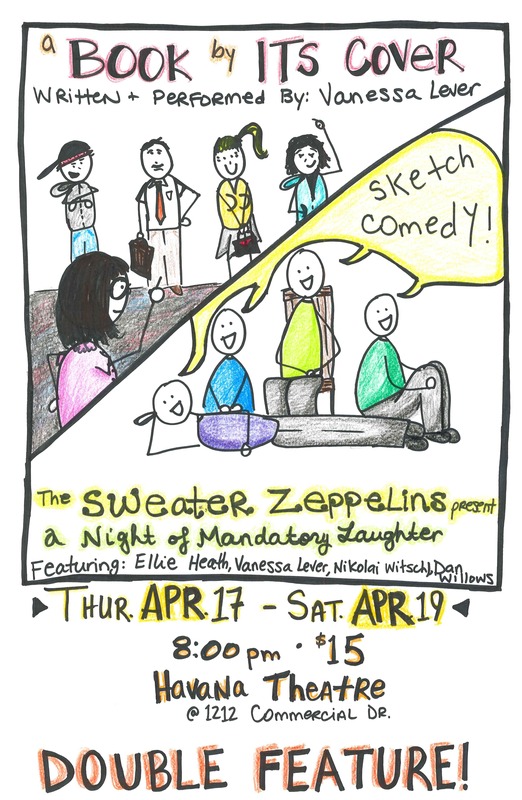 Plus, it’s a DOUBLE BILL show with my sketch comedy group The Sweater Zeppelins, called A Night of Mandatory Laughter. We’ll be doing a 40 minute set after my solo show! Lucky you! And lucky me 🙂 This is probably our funniest show to date. We have a new face, Dan Willows, who will be joining Ellie heath, Nikolai Witschl and I on stage. And the comedically brilliant and visually gorgeous Brynn Peebles also contributed some of her funny ideas to the show. So come on down to this (I’m assuming) HISTORIC event April 17 – 19 at the Havana Theatre on Commercial Drive. Tickets are $15 and can be reserved at eventbrite.com to guarantee seats. Look at our poster! Guess who drew these silly pictures?